We have a new client that we're trying to get situated. Her previous agency is still on her analytics accounts and does not want them to know who is now working on her project since the previous one pretty much screwed her over. Note that her account is the one who created the analytics over 5 years ago account and she has all permissions. When trying to remove users from the account level, she gets this prompt. Clicking the "remove" button does nothing. 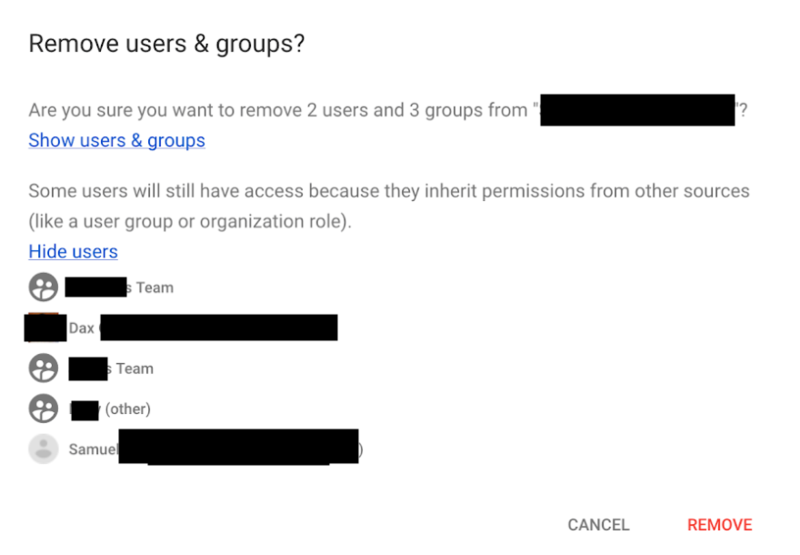 After calling Google, and being passed around a lot, the Google rep said that there is no way to remove these users from the account and they have to remove themselves. The agency will no longer respond to her emails. It doesn't make a lot of sense to me as to how an admin user wouldn't be allowed to remove another user. I found no help resources on this topic. What are the steps needed to take in order to remove users from an analytics account when the "remove" button doesn't work and you have permission to manage users? Browse other questions tagged google-analytics or ask your own question. Google analytics: how many visitors have visited n times? Don't count visitors who go to a certain link using Google Analytics? Is linking Search Console and Analytics as property owner by delegation possible? Does cross domain tracking in Google Analytics require referral exclusions for subdomains?